Interestingly enough, as I sit here typing this blog post, I am in my DC apartment after just being notified of a two hour delay for all Federal agencies in Washington, DC due to a whopping amount of snow, folks. That is correct. Not two feet. Not even two inches….but yes, a light sprinkle of white feather-dust gracing the side streets of DC. And with that, let me take this moment to introduce you to perhaps the most paranoid and frantic city on earth when it comes to even the slightest possibility of snowfall. Coming from Canton, NY and even coming from Rochester, NY, I find it especially amusing that a dusting of snow can cause a delay in DC while a -30 degree day in St. Lawrence County accompanied by inches upon inches of snow is seen as the norm. Oh, the many differences I have just begun to face while living in DC! It is always a challenge (an exciting but a bit stressful challenge) to grow accustomed to a different lifestyle. This new lifestyle is engulfed with social activities knocking at my door 24/7, a new internship full of writing, editing, and preparing for an upcoming “Romance Fiction in the Digital Age” event at the Library of Congress and the realization that how I will be using my time in the next four months is starkly different than how I used my time over winter break. But, with this said, DC is even more than I expected it to be thus far. I am lucky enough to have a supportive, laid-back roommate named Miranda. We have already strategized our “game-plan” to balance each other out this semester. By this I mean that I tend to be very stress-ridden and anxious if I do not have enough time for everything I want to accomplish while Miranda tends to have a very chill and relaxed outlook on her day-to-day activities. Learning these elements about each other has already allowed us to look to each other for guidance when we succumb to our typical downfalls. When Miranda needs that motivation to reply to emails before going to bed or someone to persuade her to stop Facetiming her best friends 24/7 in her free time, she turns to me. When I need someone to tell me to relax when I realize that I am tired and do not have enough time to perhaps make this blog post, or do my laundry, I turn to her. Not only have I started building relationships that I know will last a great deal longer than my time here this semester, but I have only just begun to explore the gorgeous sites, towns, and culture of DC. Spending this past Sunday in Georgetown was unbelievable to say the least; exploring Dupont Circle on Saturday allowed me to meet even more new people from various backgrounds and traveling to Capitol Hill only a few times thus far has given me a small glance at the beautiful buildings that make DC so gorgeous. So, I am sure you all have a little extra time on your hands due to the massive BLIZZARD hitting the Boston & NYC areas that I too am experiencing in DC (….) 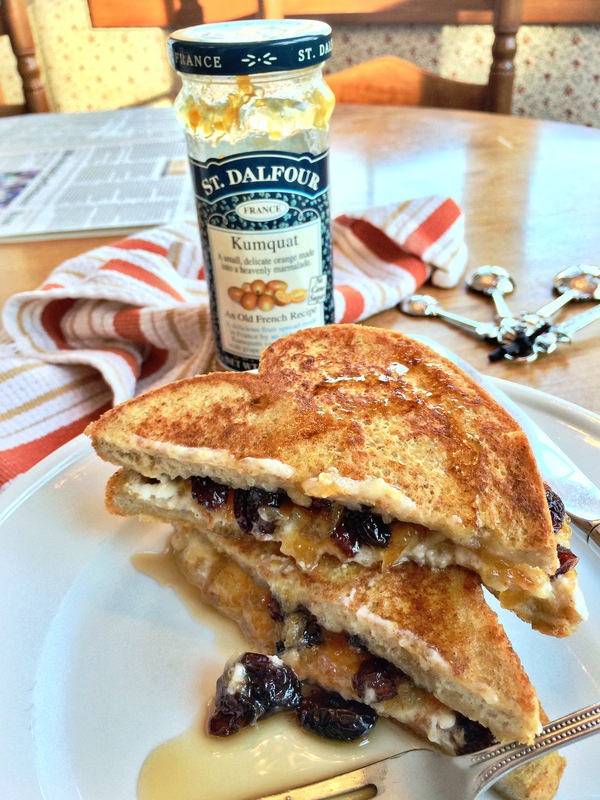 thus, may I suggest that you take that time to whip together some delectable stuffed french toast?!? 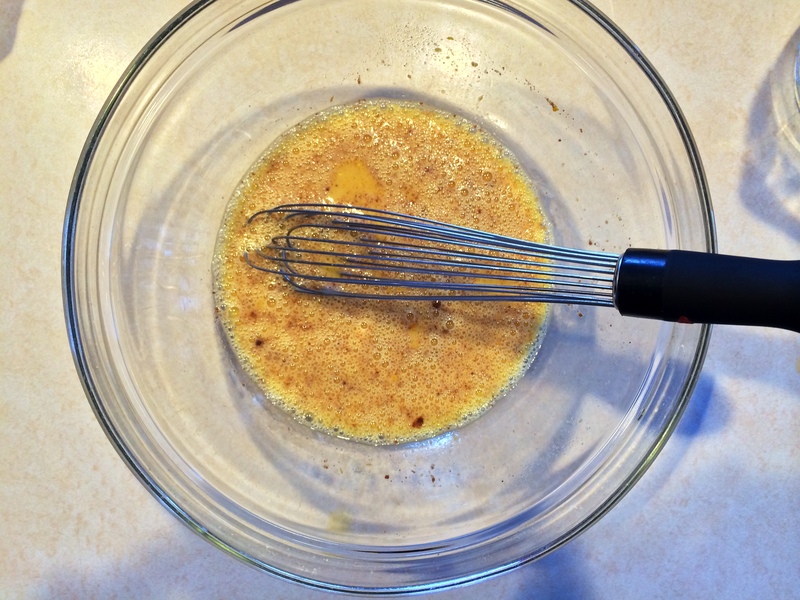 Preheat oven to 300 degrees F. In a large bowl, whisk together eggs, milk, orange zest, orange juice, cinnamon, nutmeg and vanilla. 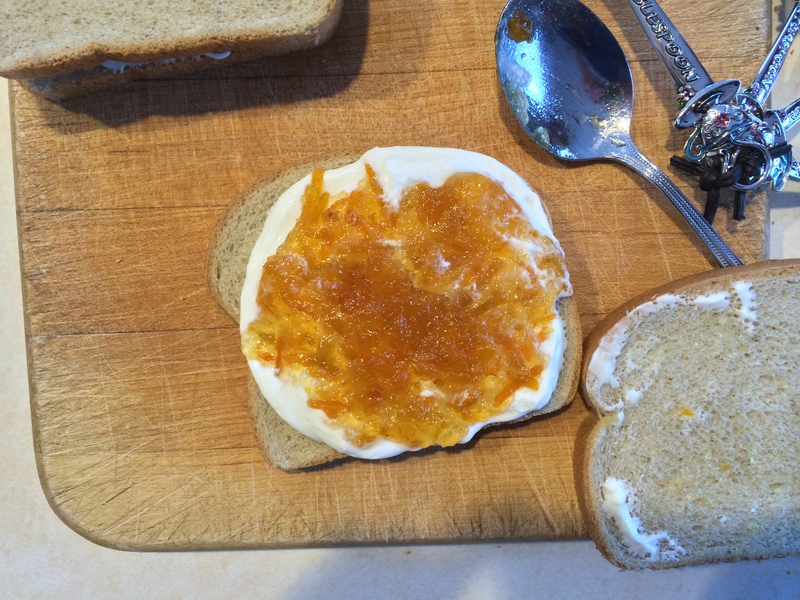 Lay one bread slice on work surface and spread with a dollop of Greek yogurt and half the marmalade. Top with another slice. Repeat with other two slices of bread. 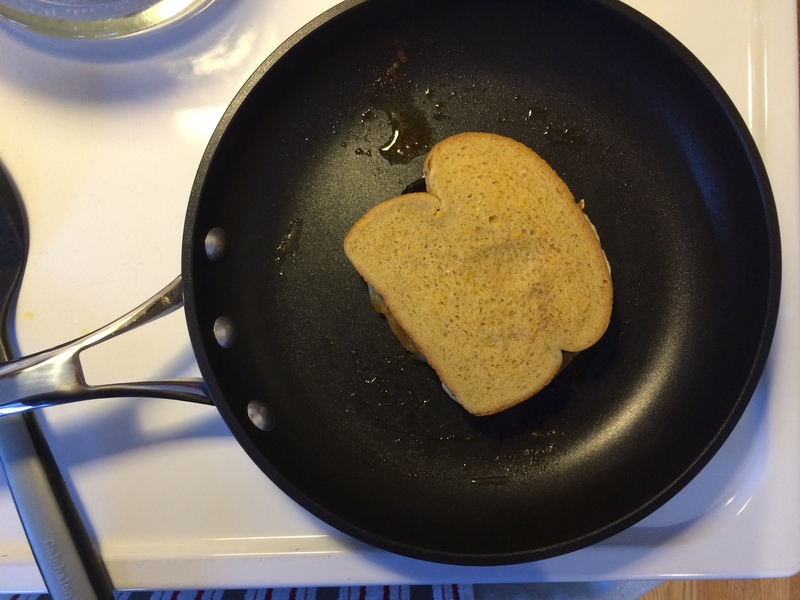 Lightly butter a griddle or pan and turn on to medium heat. One at a time dip the sandwiches in egg mixture and coat evenly. Remove and place on pan. Cook until golden brown, ~2 minutes. Flip sandwich and do the same. 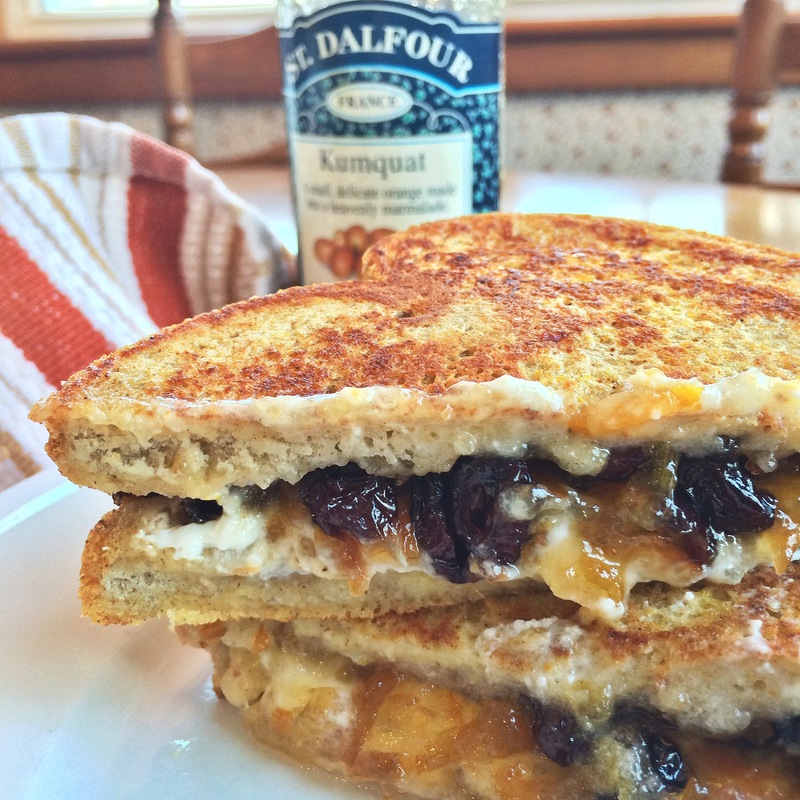 Place both sandwiches on a baking sheet and put in the oven for ten minutes. Remove, sprinkle with some powder sugar and bon appétit! Previous Post Oh Deer, look at the size of that Buck(wheat stack)!